Hi Zealny, thanks for the feedback. For each of the sub module, I usually include the modules and links required at each individual posts. You can also install them using pip. However, I will try to write a separate post on the list of modules required as I know it can be confusing. Note that the main module “yahoo_finance_data_extract” require Excel (Windows) to extract certain paramters. This can be disabled if not running on window system. You can email me if you need help on this. Thanks. I installed all modules except difflib. I could not find it online. Unable to use the GUI function. Hi zealny, not sure if difflib is available in standard python 2.7 library, Can you try to just import it? If not, you may need to use pip install. xls_table_extract_module can be found in Github as followed: https://github.com/spidezad/excel_table_extract. You also need pyExcel which is available in Github as well. How do I disable it so that I can use this in OSX? You can comment out the module (xls extractor). 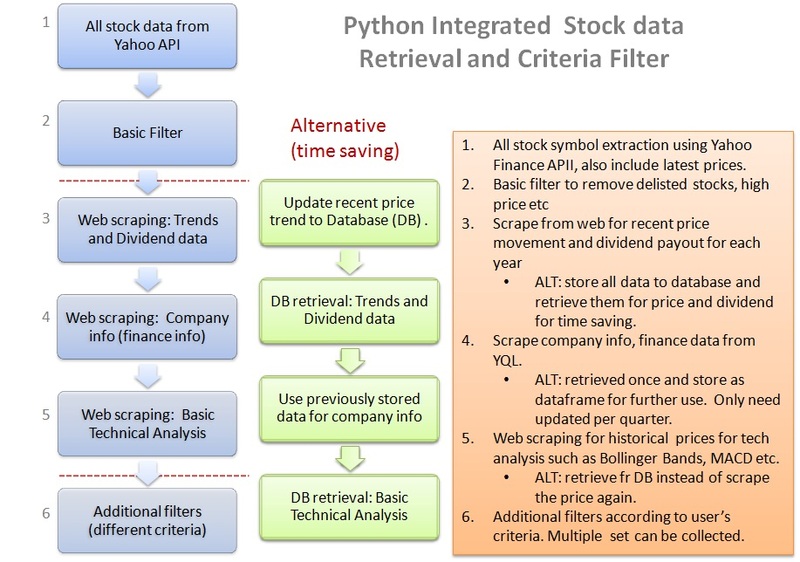 The module mainly for extracting list of stock symbols. You can replace the lines where it call the module function with appropriate list. You can refer to my Reply to Alberto on Mar 5, 2016 for more details. Just scrolled further down to it. pyExcel.py need win32com.client.dynamic module. I think I cant make it work on linux systems. Hi Zealny, I think you can straight away import the difflib library, think it is already available in the std library. self.cur_quotes_property_str = ‘nsl1opvkj’ #default list of properties to copy. can set the properties here. I have been trying to do something like this. Wow, there are so much details in all your posts. Have to say Thanks very much! Thanks for the great work, this code is amazing! I’m using a Mac… I read in the comments section that you have a way to avoid this error when you are not using windows. Can you please help me? You can comment all and replace the self.announce_watchlist with a list of stock symbol, replace the self.companyname_watchlist with list of corresponding company name. I installed the DictParser module using “python setup.py install” and checked the dist-package directory, all of the files seem to be present. Any help you can offer is greatly appreciated. Hi Jake, are you able to find this module DictParser folder in the python site-packages directory? If yes, you might be missing an __init__.py. Can you try create an empty file and rename is as __init__.py? See if it works. Hi, first of all thanks for this great work ! I am new to python and trying to run your scripts. Which version of python are you using for the scripts ? I have different problem when running using different version of python. Hi Wai Kun, thank you for your good feedback. I am using python 2.7. Hope that helps. I am now having problem on the pyExcel part. I installed the pyexcel using pip, and the pyexcel from your github too. Hi Wai Kun, can you change the line to: from pyExcel import UseExcel and see if it works? Thanks. Hi Kok Hua, manage to make it pass the last error. Now I stuck at the stockselection_for_sgx.xls file. Can you share the format of this xls file, so that i can create my own list. I have added the file to the git hub. https://github.com/spidezad/yahoo_finance_data_extract. Hope it helps. Hi, great work on this code. I am getting an error “ImportError: cannot import name pyExcel” but I have already installed pyExcel (from Git). Also, there are some references to pyET_tools which does not exist. Can you help? Hi, are you able to find this module PyExcel folder in the python site-packages directory? If yes, you might be missing an __init__.py. Can you try create an empty file and rename is as __init__.py? See if it works. Hey kok Hua, I am getting an issue where there is no module named DictParser. I read a previous comment someone else was struggling with it. I downloaded dict Parser module and ran the setup.py install. All ran correctly but it still wont import. After checking out the site-packages folder i have : DictParser-1.0-py2.7.egg-info(file not a folder), Dict_create_fr_text.py all inside just site-packages , there is no DictParser Folder. so it doesnt look right at all. How do i fix this? Hello, is there a get started instruction on how to use it? Hi IKEL, regarding your question on the get started instruction,unfortunately I do not have an instruction on hand. I will try to write one in near future. For now, perhaps you can start with the Stock_Combine_info_gathering.py which will run the scripts. There is an option to run different parts of the module in line 85. Hi IKEL, regarding the error on the ‘YFinanceDataExtr not defined, can you check the yahoo_finance_data_extract.py file is in the same directory as the script (Stock_Combine_info_gathering.py)you running? It should work if they are all under same directory. Let me know if you still have problems running. I was not able to run it either. No DictParser & other stuff. Hi Avraham, most of the yahoo stock API no longer working so you might have trouble running this. Let me see if I can come up with a new post for a working version. Hi Slasanto, thank you for your compliment. 🙂 For the anaconda environment, are you using Python 3.x? If yes, then the scripts will not work as they are based on python 2.x. Hi Slasanto, are you able to find this module DictParser folder in the python site-packages directory? If yes, you might be missing an __init__.py. Can you try create an empty file and rename is as __init__.py? See if it works.